I know you all have dealt with this issue. Someone sends an email CCing you and tons of other people. 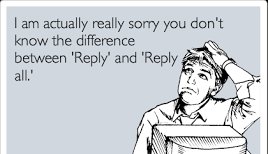 Then it begins - the dreaded reply all, and it never stops at just one person. Once the first person does it, it become infectious, and more and more people start replying all. And the worst part of it? Either the responses don't apply to you, or after a bit, you just don't care anymore. What can you do? Great news is you don't have to pay attention to it any longer. 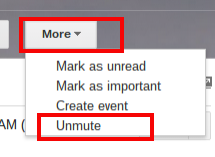 Just use the Mute function in Gmail. So how do you get to this nifty feature? Simple, open up the email while it is still in your inbox. Click the More button and select Mute. A Muted label will get attached to the email and it will be archived to All Mail. From that point on, any email in that conversation will automatically be moved to Archive/All Mail. Note: you can also use the keyboard shortcut m when the message is opened to mute. Now, let's say you find out you are now missing some important discussion and you need to unmute the conversation. There are two ways to find the message. The first method is to go into the All Mail folder and scroll until you find the correct thread. The second method is to search is: muted. Once you find the conversation using one of the two methods above, you can then either open the email and click the X on the click on More again and select Unmute. This will place the thread back into the Inbox and allow all future messages in the conversation to appear in the Inbox so you won't miss anything. 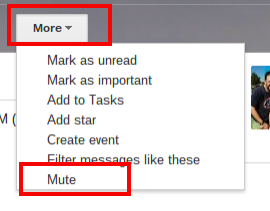 Note, Mute function works a bit differently in Inbox by Gmail. In Inbox by Gmail, you only can mute a conversation using the keyboard shortcut m. You can find the message the same ways as in classic Gmail, however to unmute, just click the Done check mark, which will mark the conversation as not done, move it to the Inbox, and remove the Muted label from classic Gmail. What are some other ways that you are using the mute? > let's say you find out you are now missing some important discussion and you need to unmute the conversation. Scott, you commented in the following thread that there is no way to mute messages in the Inbox mobile app, but that is not accurate... You can mute messages by holding the Done button.